Bitcoin miners play a critical role in the bitcoin ecosystem by processing and securing payments. They’re rewarded for their efforts by a combination of newly issued bitcoin and transaction fees. The analysis below explores the incentive structures underlying mining efforts and looks at the potential effects of an increased block size limit on miner’s willingness to participate in the network. Based on 2015 data, there are nine miners and/or pools that comprise roughly 75% of the mining capacity in the network. For context, in 2014 there were ten participants responsible for 75% of the mining capacity. 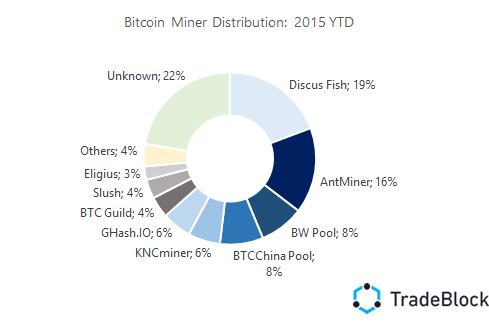 The chart below illustrates the market share for the largest miners in 2015. Miners are compensated via both the block mining reward known as the coinbase, currently 25 XBT per block, and also via fees paid by users seeking to have their transactions included in the upcoming block. 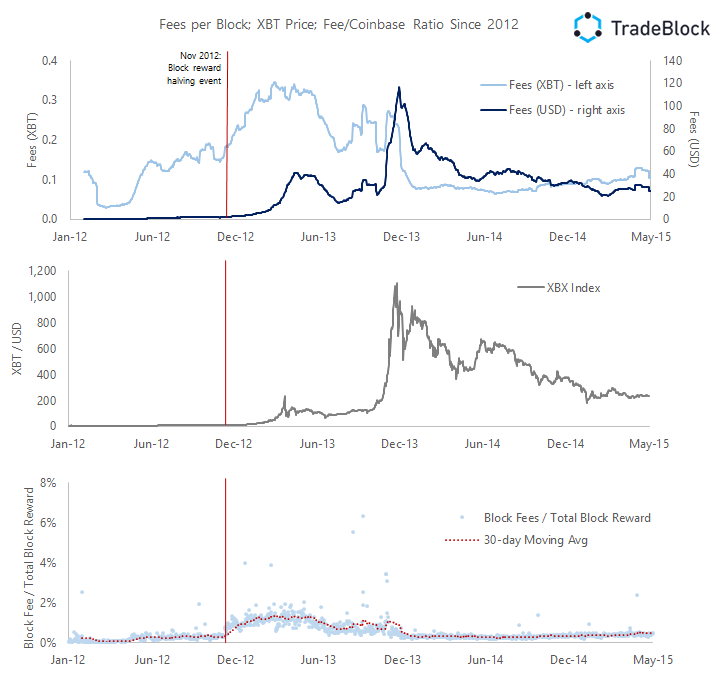 The average total fees collected per block has remained fairly steady since 2014 at roughly 0.1 XBT, or ~$25 at current market rates. As visible in the charts below, transaction fees per block are roughly in line with where they were before the November 2012 halving of the mining reward. Similarly, transaction fees as a % of the total block reward (including the coinbase) remains fairly low at roughly 0.5%, implying that miners derive substantially all of their compensation in the form of the coinbase. Per the charts below, the top miners in 2015 all earn fees that are roughly in-line with the average; the results are also consistent with the average block fee stats above (roughly 10M satoshis or ~0.1 XBT). Eligius appears to stand out for receiving higher fees-per-block than other miners – presumably for prioritizing higher fee transactions. This is also evidenced by a higher average fee-per-transaction earned by Eligius (not shown in the chart). Overall, we note that Eligius’ average fee-per-block is still within one standard deviation of the group average. As it relates to mining revenues, we went a step further and examined the proportion of accepted transactions in each block that did pay a mining fee. In general, the data shows that on average in 2015, only 1.9% of transactions in a given block did not include a fee. Discus Fish, BTC Guild, and Eligius included less than 1% no-fee transactions, while certain smaller miners (not shown on chart) had higher proportions (BitMinter in particular stood at 8.7%). Assuming miners operate at current levels of efficiency and there are no significant changes to the competitive landscape, miners’ stand to lose 50% of their reward per block at the next scheduled halving event when the coinbase decreases 12.5 XBT per block (projected to occur in 3Q16). Moreover, while miners can exert notable discretion when accepting transactions, they appear limited in their ability to generate higher transaction fees – currently only 0.5% of per-block compensation. How, then, can the network incentivize miners enough to continue growing hashing power and related security? Below we summarized the required level of changes in the price of bitcoin, transaction fees, or number of transactions that would allow miners to continue to earn current levels of compensation (at roughly 25.1 XBT) following the next halving event. All other factors constant, either the price of bitcoin would need to double, or transaction fees increase by a factor of 120x or transactions per block increase 120x. Our analysis indicates that for compensation per block to remain constant after the next halving event, fees would have to increase to ~$4.6 per transaction (from 4 cents today) if transaction volumes and XBT price remain unchanged. The data shows that at the current assumed max transaction rate of 1,667 transactions per 1MB block (see Part 2: Macro Transaction Trends for more info), the average fee would have to increase 48x (to approximately $1.9 per tx), all else equal. 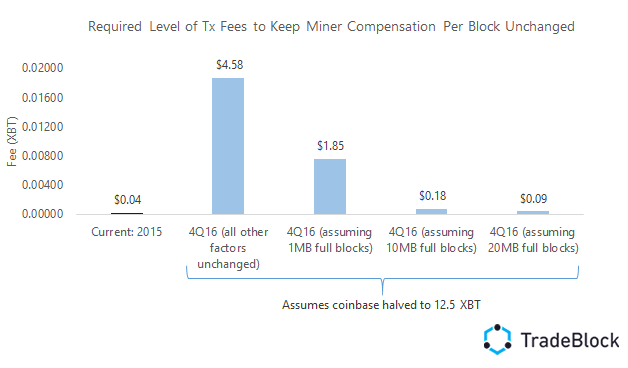 However, the ongoing block size debate offers an additional lever for miner compensation. If the maximum block size were increased beyond 1MB, each block could support a greater number of transactions, in turn reducing the per-transaction fee at which miner compensation per block remains at current levels. As shown in the chart below, the required fees per full 10MB and 20MB blocks to keep miner compensation at roughly 25.1 bitcoin are 18 cents and 9 cents, respectively. Worth noting, current transaction growth rates do not indicate anywhere close to full 10MB or 20MB blocks by the next halving event (see Part 2 for more info). As such, the benefit of larger blocks offering greater compensation to miners while keeping fees low is calculable, but likely multiple years away from being realized. Lastly, it is important to point out that the aforementioned analysis seeks to assess miner compensation on a macro level, essentially focusing on compensation per block. In reality, if compensation per block were to decrease by ~50% with no offsetting increase in XBT price or fees, the less efficient (and poorly capitalized) miners would likely cut back on their operations. Consequently, the surviving miners would likely find more blocks, thereby potentially increasing their compensation over time without a requisite adjustment of the per-transaction fee.